We have investigated the genetic basis of the immune response to dietary gluten in HCD4/DQ8 and HCD4/DQ6 double transgenic mice. Mice were immunized with gluten i.p. or individual peptides s.c. and spleen or draining lymph node T cells were challenged in vitro. Strong proliferative responses to gluten were seen in the HCD4/DQ8 mice, whereas the HCD4/DQ6 mice responded to gluten poorly. A series of overlapping peptides spanning gliadin were synthesized. The HCD4/DQ8 mice reacted to many of the individual peptides of gliadin, while the HCD4/DQ6 mice were relatively unresponsive. T cells isolated from HCD4/DQ8 mice also responded well to modified (deamidated) versions of the gliadin peptides, whereas HCD4DQ6 mice did not. The T cell response to gluten was CD4 dependent and DQ restricted and led to the production of cytokines IL-6, TGF-β, and IL-10. Finally, intestinal lymphocytes isolated from gluten-fed HCD4/DQ8 mice displayed an activated phenotype. These data suggest that this HLA class II transgenic murine model of gluten sensitivity may provide insight into the initiation of the MHC class II-restricted gluten sensitivity in celiac disease. Celiac disease, or celiac sprue (CS),3 is an autoimmune enteropathy induced by the ingestion of dietary gluten (1). Shortened villi, crypt hyperplasia, and marked lymphocytic infiltration into the lamina propria characterize the small intestine in CS (2). Withdrawal of gluten from the diet allows the small intestine to heal and revert back to a normal phenotype. Susceptibility to CS is strongly associated with the HLA class II haplotype DR3/DQ2 encoded by the alleles DQA1*0501/DQB1*02. DRB1*0301 or the HLA-DR4/DQ8 haplotype encoded by DRB1*0401 DQA1*03/DQB1*0302 (3, 4, 5, 6, 7, 8). Gluten is composed of two proteins, glutenin and gliadin, and evidence suggests that the gliadin fraction induces disease (9, 10). Gliadin is a unique protein in that it contains a large number of glutamine residues (8). Tissue transglutaminase (tTG) is an enzyme that, among its other functions, catalyzes the deamidation of glutamine (Q) residues to glutamic acid (E) (11, 12). tTG is believed to play a pivotal role in creating gliadin neoepitopes in the intestine by deamidating specific glutamine residues in the gliadin molecule (12, 13). The particular residues that are deamidated may enhance peptide binding to the binding groove of the celiac disease-associated class II molecules DQ2 or DQ8, thereby increasing the antigenicity of the gliadin peptide(s) (14). Understanding the immunopathologic aspects of CS has been hindered due to the lack of an animal model for the disease. Transgenic mice expressing human class II molecules (in the absence of endogenous mouse class II) have been used to study other autoimmune disorders, including rheumatoid arthritis and multiple sclerosis (15, 16, 17, 18). We have studied the effect of gluten in double transgenic mice expressing HLA-DQ and human CD4 genes in the absence of endogenous class II and CD4 genes. We determined the effect of specific MHC molecules on the development of gluten sensitivity and the role of specific gliadin epitopes as a way to provide insight into the initiation of celiac disease. Cosmids containing either the DQ8 or DQ6 gene were microinjected into (B10 × SWR)F1-derived embryos. Transgene-positive mice were then crossed with the class II knockout mouse from a B6 × 129 background (courtesy of Drs. C. Benoist and D. Mathis, Institute de Genetique et de Biologie Moleculaire et Cellulaire, University of Louis Pasteur, Strasbourg, France). The founder mice were backcrossed to B10 mice. The resulting mice expressing human class II and lacking endogenous mouse class II were designated AB0DQ8 or AB0DQ6. These mice were then mated to mice expressing human CD4 (hCD4+, courtesy of R. Flavell, Yale University School of Medicine, New Haven, CT) lacking mouse CD4 (CD40, courtesy of T. Mak, Ontario Cancer Institute, University of Toronto, Toronto, Ontario, Canada). The double transgenic, double knockout mice were intercrossed to maintain the line. Thus, these lines have similar background but are not congenic. Transgene-negative full siblings were used as controls. These mice have an intact immune system and are capable of generating both a Th1 and a Th2 response (16, 19, 20, 21). Surface expression of the human class II and HCD4 transgenes on peripheral blood leukocytes was monitored by flow cytometry. Mice were maintained in the pathogen-free immunogenetics mouse colony at the Mayo Clinic (Rochester, MN). Crude gluten was purchased from Sigma-Aldrich (St. Louis, MO). Overlapping peptides of gliadin were synthesized at the Peptide Core Facility of the Mayo Clinic. These peptides were 20 aa in length, with a 10-aa residue overlap with the previous peptide. Rice cereal was used as a negative control. Cultured supernatants from cell lines producing mAbs for the HLA-DQα chain (IVD12), HLA DR (L227), DQ6β chain (61.11.1), and CD4 (GK1.5) were prepared in our laboratory. Mice were injected with 20 μg crude gluten or 200 μg purified peptide emulsified in CFA in the tail and hind footpad. The draining lymph nodes were harvested 7 days postinjection and the cells were isolated as described previously (22). Lymphocyte proliferation was determined by incorporation of [3H]thymidine. Results are expressed as difference (Δcpm) in incorporation and calculated as Δcpm = mean triplicate counts in Ag-containing cultures minus mean triplicate counts of cultures with medium alone. Mice were immunized with 500 μg crude gluten or rice i.p. with CFA on day 0. On day 7, mice were fed 2 mg gluten (rice) by gavage. On day 14, intestinal T cells were isolated as previously described (23). Briefly, intestines were washed six times in CMF containing FCS for 15 min. Intestines were then incubated in a CMF/FBS/EDTA solution at 37°C for 15 min. The intestines were then treated with RPMI 10 and collagenase for 2 h. The resulting supernatants from the CMF/FBS/EDTA incubation and collagenase treatment were then combined and centrifuged. The resulting cell pellet was treated with pan T (anti-Thy1) Abs (Dynabeads; Dynal Biotech, Oslo, Norway). Intestinal T cells were incubated at a concentration of 1 × 106 cells/ml in a 0.5-ml volume in 24-well plates (Costar, Cambridge, MA). T cells were then incubated with gluten in the presence of irradiated spleen cells for 72 h. The cultures were then centrifuged, the cells were subjected to FACS analysis, and the supernatants were tested for cytokines. Cells were harvested after a 72-h incubation with gluten at 37°C and centrifuged, and the supernatants were collected for cytokine analysis. Cytokine secretion was analyzed by ELISA using mini-kits for IL-2, IL-4, IL-6, TNF-α, IFN-γ, IL-10, and TGF-β from Duoset (Genzyme Diagnostics, Cambridge, MA). All ELISAs were performed on 96-well flat-bottom microtiter plates (Immulon 2; Dynatech Laboratories, Chantilly, VA). Plates were read in a microtiter autoreader (Bio-Rad, Pleasanton, CA) at 450 nm. Quantification of cytokine levels was determined by comparison with standards. Intestinal T cells were isolated as previously described (22). Briefly, intestines were washed six times in calcium, magnesium-free HBSS (CMF) containing FCS for 15 min. Intestinal pieces were then incubated in RPMI and collagenase twice for 1 h. T cells were purified using anti-Thy1.2 Dynabeads. They were then incubated for 72 h in the presence of gluten. mAbs for the following cell surface markers were used for flow cytometry: CD4, CD25, CD45RB, CD62 ligand (BD PharMingen, San Diego, CA). Serum was isolated from mice after immunization and subsequent feeding with gluten or rice. Anti-gliadin IgG and IgA Abs were detected by ELISA using a kit from Inova Diagnostics (San Diego, CA) using IgG and IgA standards for comparison. A two-tailed Student’s t test was used to compare the means of responses in all assays, which were performed in triplicate. Three to five mice were used in each experimental group. A p value of <0.05 was considered significant. Cross-sections from the proximal and distal intestine were preserved in formalin and stained with H&E. Specimens were examined by light microscopy for changes in villous architecture, epithelial change, and inflammation. The ability of the transgenic mice to respond to gluten was examined using standard T cell proliferation assays. HCD4/DQ8 and HCD4/DQ6 mice were injected with gluten in the base of the tail and hind footpad (n = 5). One week later, draining lymph nodes were harvested and examined for T cell responsiveness. As shown in Fig. 1⇓, both HCD4/DQ8 and HCD4/DQ6 mice responded to gluten, but the T cells from HCD4/DQ8 mice mounted a much greater proliferative response than cells from the HCD4/DQ6 mice (cpm vs cpm). No proliferation was seen in HLA class II-deficient mice (data not shown), and no activity was detected in either strain of mice when rice was used as the grain protein (Fig. 1⇓). HCD4/DQ8and HCD4/DQ6 lymph node cell response to in vitro challenge of gluten and rice protein. Data represent the Δcpm from the mean [3H]thymidine incorporation for triplicate cultures (p < 0.001). To determine the subpopulation of T cells responsible for proliferation to gluten, mAbs to CD4 and DQ were added to the wells. Proliferation was inhibited (Fig. 2⇓) when anti-CD4 was added to the well. In addition, proliferation was inhibited when anti-DQ mAb was added to the well, whereas anti-DR had no effect. Taken together, these data indicate that the in vitro response in HCD4/DQ8 transgenic mice is mediated by CD4-expressing, DQ-restricted T lymphocytes. The HCD4/DQ8 response to gluten is restricted by DQ and mediated by CD4+ cells. Data represent the Δcpm from the mean [3H]thymidine incorporation for triplicate cultures. Cultured supernatants from intestinal HCD4/DQ8 and HCD4/DQ6 mice were assayed for the production of various cytokines. No IFN-γ was found in the supernatants from either transgenic mouse after immunization and gluten feeding. Similarly, minimal amounts of IL-2 were seen in these cultures. IL-6 was expressed at high levels in lymphocyte cultures from HCD4/DQ8 mice and to a somewhat lesser extent in cultures from HCD4/DQ6 mice after exposure to gluten (Fig. 3⇓). IL-10 was produced at the same level in lymphocytes isolated from both strains of mice after gluten immunization (Fig. 3⇓B). The level of IL-4 produced by cell culture in these mice was minimally affected by gluten exposure. Interestingly, high levels of TGF-β were induced by gluten exposure in cultures from both strains of mice; however, the HCD4/DQ8 cultures expressed more TGF-β than the HCD4/DQ6 mice (Fig. 3⇓C). Similar results were seen in cultures of splenic lymphocytes. Thus, contact with gluten induces a T regulatory cytokine response in both strains of transgenic mice, with greater levels of the cytokines produced by the sensitized HCD4/DQ8 mice as compared with the less sensitized HCD4/DQ6 mice. A, IL-10 production from gluten-stimulated HCD4/DQ8 and HCD4/DQ6 lymphocytes. Results are expressed as picograms per milliliter and represent the difference between gluten-fed HCD4/DQ8 and HCD4/DQ6 mice (p < 0.04). B, IL-6 production from gluten-stimulated HCD4/DQ8 and HCD4/DQ6 lymphocytes. Results are expressed as picograms per milliliter in DQ8 and DQ6 mice (p < 0.002). 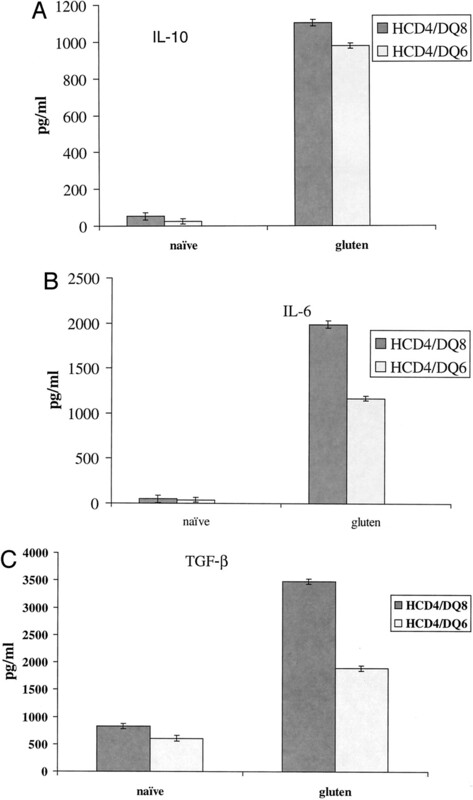 C, TGF-β production from gluten-stimulated HCD4/DQ8 and HCD4/DQ6 lymphocytes. Results are expressed as picograms per milliliter in HCD4/DQ8 and HCD4/DQ6 gluten-fed mice (p < 0.003). The T cell response to specific antigenic determinants of gliadin was studied using overlapping peptides. Lymph node cells from the HCD4/DQ8 mice were able to respond to a greater variety of synthetic peptides when compared with HCD4/DQ6 mice (Fig. 4⇓). In particular, peptides corresponding to amino acid residues 1–20 and 10–30 induced significant T cell proliferation in the HCD4/DQ8 mice. Additionally, a peptide spanning amino acids 206–217 also resulted in a strong proliferative response. Epitope mapping of overlapping 20-mer synthetic gliadin peptides in HCD4/DQ* and HCD4/DQ8 transgenic mice. HCD4/DQ8 mice recognize a broader range of gliadin epitopes than HCD4/DQ6 mice. Data represent the Δcpm from the mean [3H]thymidine incorporation for triplicate cultures. n = 6 mice per peptide. Previous studies using human T cell clones have indicated that a peptide spanning residues 206–217 of gliadin was particularly antigenic for DQ8+ T cell lines derived from patients with celiac disease, and that deamidation of certain residues of this peptide by tTG increases antigenicity (12, 24). We tested whether simulated deamidation of specific residues in gliadin peptide 206–217 (SGQGSFQPSQQN) would increase the antigenicity of the peptide in these transgenic mice. The amino acid of the native gliadin peptides (capital letters) are replaced by glutamic acid E. Peptides that were synthesized with deamidated residues (italics) at positions 208(SGEGSFQPSQQN), 215(SGQGSFQPSEQN), and 216(SGQGSFQPSQEN) resulted in T cell responsiveness (Fig. 5⇓), indicating that these residues may be involved in regulating the immune response to gliadin and that deamidation may be an important factor in inducing or amplifying the response. Cells from DQ6 mice did not recognize these altered epitopes. Proliferative response of HCD4/DQ8 and HCD4/DQ6 T cells to wild-type peptide 206–217 and to simulated deamidation of single-glutamine variants. Data represent the Δcpm from the mean [3H]thymidine incorporation for triplicate cultures. n = 6 mice per peptide. Patients with celiac disease have anti-gliadin IgG and IgA present in their sera. To determine whether the transgenic mice also produced Abs to gliadin, HCD4/DQ8 and HCD4/DQ6 mice were bled and their sera were analyzed for the presence of IgG and IgA Abs to gliadin. High levels of anti-gliadin IgG were found in the HCD4/DQ8 mice. The HCD4/DQ6 mice produced anti-gliadin IgG Abs, but the levels were barely detectable and similar to levels in rice-fed HCD4/DQ8 mice (Fig. 6⇓). No anti-gliadin IgA was detectable in either strain of transgenic mouse. Endomysial IgA Abs are recognized in human celiac disease. No endomysial IgA or IgG Abs were detected in the mouse sera. HCD4/DQ8 mice immunized with gluten produce anti-gliadin IgG Abs. Results are expressed as EU using the following equation: EU = Absorbance mouse sera − Absorbance blank (405)nm) × 100. n = 6 mice per group; p < 0.002. Several of the gluten-fed DQ8 mice showed poor growth and developed a wasted appearance. However, no gross changes in intestinal morphology or gross inflammation was identified in these mice by the time of sacrifice. There was no change in villous architecture, inflammation, or enterocyte height, characteristics most often associated with celiac disease. Despite this, lymphocyte activation by gluten was identified in the mucosa. Intestinal lymphocytes were subjected to FACS analysis and stained for a variety of activation markers (Fig. 7⇓). Gluten stimulated a population of cells in HCD4/DQ8 mice that have the following phenotype: CD4+CD25+CD62Llow. This phenotype is consistent with an activated population of cells. FACS analysis of HCD4/DQ8 T lymphocytes. Intestinal cells express and activated phenotype in response to gluten. T cells were stained with mAbs to CD4, CD62 ligand, and CD25. n = 3 mice. In this study, T cell responses to gluten and peptides of gliadin have been examined using transgenic mice expressing HLA class II molecules DQ8 (HLA-DQA1*0301 and HLA-DQB1*0302) and, for comparison, HLA-DQ6 (HLA-DQA1*0103 and HLA-DQB1*0601). The significance of this paper lies in the demonstration of an HLA class II-specific response to an exogenous food Ag (wheat gluten) in transgenic mice that mimics the gluten sensitivity aspect of human celiac disease. In humans, the HLA class II Ags have been associated with a number of autoimmune diseases, including CS, insulin-dependent diabetes mellitus, rheumatoid arthritis, and multiple sclerosis. Of these, celiac disease has the strongest HLA association (5). In fact, very few patients without the specific haplotypes have been described (8, 25). Although a particular HLA haplotype is virtually required to produce celiac disease, it is clear that those HLA alleles alone will not produce disease (8, 26). We have demonstrated that both HCD4/DQ8 and HCD4/DQ6 transgenic mice elicit in vitro responses to gluten that are HLA-DQ restricted and dependent on CD4+ cells. The HCD4/DQ8 in vitro responses to gluten were stronger than those of the HCD4/DQ6 mice, although both strains were able to produce a response to the crude gluten preparation. In addition, the HCD4/DQ8 mice responded to a number of gliadin-derived peptides, while the HCD4/DQ6 responses were minimal in number and degree. Several of the gliadin peptides to which the HCD4/DQ8 mice respond have been implicated as being pathogenic in celiac disease in humans (11, 27). While several studies have suggested that native unaltered peptides of gliadin were antigenic in celiac disease, gliadin lacks the negatively charged amino acids needed to bind to the recognition sites on the DQ2/8 molecules (28, 29, 30). It has since been recognized that the gliadin molecules (or peptide fragments derived therefrom) undergo changes that alter the binding characteristics of gliadin and, ultimately, its ability to induce a cellular immune response. Much recent work has described the probable role of tTG in the development or perpetuation of gluten sensitivity in celiac disease. tTG is involved in cell-to-cell signaling and extracellular matrix formation, and is released in the gut mucosa in the setting of inflammation (31, 32, 33, 34). It is also the target for the potent humoral autoantibody response seen in most patients with untreated celiac disease. In celiac disease, it is believed that tTG plays an important role in creating new epitopes of the gliadin molecule, with which the immune system must now contend (35). Gliadin is a preferred substrate for tTG, and it is certain that the enzyme deamidates the glutamine residues of gliadin to glutamic acid (11). Gliadin contains many glutamine residues, and peptides of gliadin can be made more antigenic when specific residues are deamidated (11, 12, 13, 14). This study demonstrates that the effect of this deamidated peptide is entirely restricted to the human disease-associated DQ genotype in the transgenic mouse. tTG is released from fibroblasts in the setting of inflammation; this also occurs with infection or other perturbations of the mucosal integrity that might serve as triggering or enabling events for the development of enteropathy from gliadin sensitivity (31, 32, 33, 34, 35, 36). Deamidation of the specific peptides is believed to result in improved binding to specific pockets in the DQ molecule. Several studies have reported that naturally occurring gliadin epitopes cannot be recognized by T cells cloned from the intestinal mucosa patients with established disease, although they are recognized by T cells derived from peripheral blood (37, 38, 39). The assertion that deamidation of the gliadin peptides is essential to celiac disease is based almost exclusively on results of experiments in which T cells cloned from the active established lesion of celiac disease are used as a measure of responsiveness (10, 11, 12, 24, 39, 40, 41, 42, 43). The exception to this is the 11-mer native peptide of gliadin (206–217) that can induce proliferation in DQ8 T cell lines in its native form (41). Interestingly, a similar peptide overlapping 206–217 induced a jejunal inflammation when instilled into the jejunum of a patient with celiac disease (24). Our observations in the DQ8 mouse suggest that both native gliadin peptides and deamidated peptides can evoke T cell responses in a DQ-restricted fashion. T cell cultures derived from the biopsies of children with recent onset of disease respond to a narrower range of gluten peptides than adults (42). Thus, it is possible that naturally occurring epitopes of gliadin may be involved in the initiation of gluten sensitivity. The deamidated epitopes become important in the development or maintenance of the enteropathy, possibly as the result of epitope spreading or a second underlying predisposition or trigger to immune dysfunction. This mouse model provides a method to study the earliest process in the initiation of gluten hypersensitivity before the chronic lesion has become established. The ability to generate an HLA-DQ-restricted response to naturally occurring epitopes supports the concept that naturally occurring peptides are responsible for the initiation of disease (or at least gluten sensitivity) (24). This does not exclude the possibility that altered peptides (deamidation by tTG or otherwise) are also antigenic either during initiation of disease or later in the disease. We demonstrated that DQ8 can present these naturally occurring peptides to T cells and that CD4+CD25+ activated cells are seen in response to gluten in the small intestine of the mouse. It is, of course, possible that the mouse tTG may deamidate the peptides in vivo. If that is so, it is occurring in the absence of obvious inflammation. The absence of circulating tTG Abs (data not shown) and the use of synthetically generated peptides preclude the issues previously used to explain the conflicting findings using purified gluten proteins. The failure of these mice to develop enteropathy may be due to a number of factors. These transgenic mice may lack some other genes that contribute to the development of celiac disease. It is known that in humans the MHC genes contribute just 40% of the risk of transmission of celiac disease in families (26). These mice may lack another genetic factor or environmental stimulus such as bacterial or viral pathogen that may be involved in triggering enteropathy. It is also possible that the exposure to gluten was not of sufficient duration to induce appreciable damage. Celiac disease is associated with a predominantly Th1 or Th0 type of cytokine response in established disease (44). The cytokine profile in these mice resembles that of a regulatory phenotype and thus differs from that seen in established celiac disease. The regulatory cytokine response seen may reflect an appropriate and effective regulatory response in the setting of increased sensitivity, as occurs in the gluten-immunized DQ8 mouse. Regulatory T cells secreting TGF-β and IL-10 would certainly down-regulate inflammation, and overcoming this may be one of the first steps to producing the celiac lesion. TGF-β has complex effects in the intestinal mucosa, including regulation of T and B cell responses. It is also important in maintaining or healing the epithelial structure (45, 46, 47). Recent work with another mouse model wherein TGF-β receptor signaling has been rendered defective in the gut mucosa results in an inflammatory enteropathy that has histologic features which mimic the enteropathy of celiac disease (48). These mice also have circulating Abs to tTG (49). The specific regulatory responses generated may be part of the intact control mechanisms that occur during the mucosal response to gluten even in the sensitized mouse. This regulation may prevent (or protect the mouse from developing) the enteropathy associated with CS. This implies that this mouse models gluten sensitivity that is HLA determined but lacks the probable second defect/trait or changes in the mucosal environment required for enteropathy. It is possible that the mouse background genes are not prone to inflammation or that a second necessary luminal trigger for the conversion from sensitivity to enteropathy (other than gluten) may be absent in the specific pathogen-free environment in which these animals are kept. A particular microbial environment may be required to stimulate a pathologic immune response. The study of celiac disease has been hampered by the lack of readily usable animal models in which to study both the immunogenetics and pathogenesis of the gluten sensitivity and the subsequent enteropathy. This class II transgenic mouse model provides a potentially powerful tool with which to study the mechanism underlying the initiation of disease, i.e., the gliadin sensitivity. Our model presents a unique opportunity to dissect the genetic basis for predicting the human–food interaction that leads to celiac disease. This gluten-sensitive mouse model provides a means to examine potential interventions, such as induction of anergy, vaccination, or other therapies that may be aimed at preventing the loss of or induction of tolerance. The ability to demonstrate an HLA-restricted response demonstrates that this component of celiac disease can be reproduced without the other human genetic factors involved in celiac disease. We thank Julie Hanson and the staff of the Immunogenetic Mouse Colony for production and maintenance of the mice and Michele Smart and Susan Demaray for tissue-typing the mice. ↵1 This study was supported in part by Research Grants DK 57982 and AI 14764 from the National Institutes of Health, U.S. Public Health Service. ↵2 Address correspondence and reprint requests to Dr. Joseph A. Murray, Division of Gastroenterology and Hepatology, Mayo Clinic and Foundation, 200 1st Street, SW, Rochester, MN 55905. ↵3 Abbreviations used in this paper: CS, celiac sprue; tTG, tissue transglutaminase; CMF, calcium, magnesium-free HBSS.